State Rep. Judd Matheny (R-Tullahoma) keeps running hard to win the Republican nomination in the Sixth Congressional District. 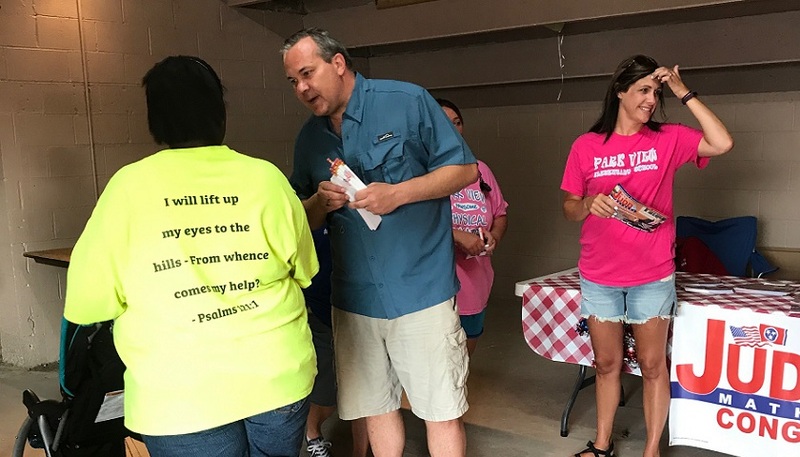 On Friday he was at the Putnam County Back to School Bash, where he handed out over 2,500 pencils and book marks to parents and school children from his booth at the Putnam County Fairgrounds. “This was such a great event,” Matheny told The Tennessee Star. “Lots of kids socializing, eating ice cream and stuffing their bags with back to school supplies,” he added. “Over a dozen area elementary and middle schools were present, as well as their respective teachers and many other community volunteers. It was a fantastic place to reacquaint myself with old friends and meet new ones” Matheny noted. So far, Matheny is the only candidate of either party to announce his candidacy for the Sixth Congressional District nomination. Rep. Diane Black (R-TN-06) has not announced whether she will seek re-election to her current position. It is widely expected that she will announce her candidacy for governor soon. Matheny made news last month when he helped organize a letter from 63 members of the Tennessee House of Representatives advising the Nashville Metro Council that they were strongly opposed to a sanctuary city ordinance under consideration. The sponsors of that ordinance withdrew it prior to its consideration on third reading.